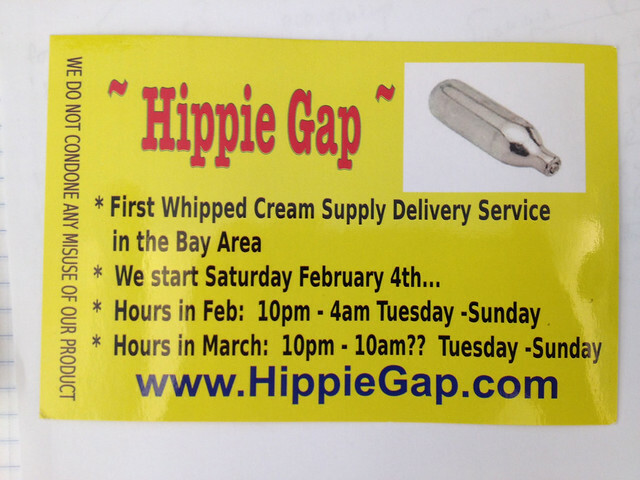 As of February 4, Hippie Gap started providing a new service for Bay Area, California citizens: Whipped Cream Supply Delivery. Yes, that means those little nitrous oxide chargers used to make fresh whipped cream (and other delights). As far as I can tell, this is a first of its kind service for any city. !!!!!!!!!!!!!!!!!!!!!!!!!!!!!!!!!!!!!!!!!!!!!!!!!!!!!!!!!!!!!!!!!!!!!!!!!!!!!!!!!! !We do NOT condone any miss use of our products!!!!!!!!!!!!!!!!!!!!!!!!!!!!!!!!!!!!!!!!!!!!!!!!!!!!!!!!!!!! !